In this post we will be discussing about rendering static HTML files in Express.js. There are number of options to render static HTML files in Express.js. 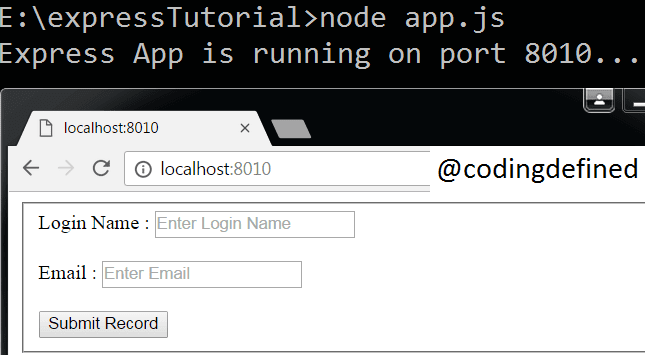 Express is a minimal and flexible Node.js web application framework that provides a robust set of features to develop web and mobile applications. res.sendFile() transfers the file at the given path and also invokes a callback function when the transfer is either failed or it succeeded. res.render() renders a view and sends the rendered HTML string to the client. If you are getting the error "Cannot find module 'html'" which means that your express is not able to render the HTML file. For that you need to set the engine as html. To do that at first we need to install ejs module by the command npm install ejs --save and then use the following code. How to solve "TypeError: path must be absolute or specify root to res.sendFile"
If you are getting this error means that the file path you have assigned is not correct.